Thanks to the company’s early success, it was able to grow into a manufacturing powerhouse that helped spread the industrial revolution around the world. Winchester still makes rifles. But they also make other products, too. In recent years, Winchester has earned praise for its innovative gun accessories as well as its award winning series of very excellent gun safes. 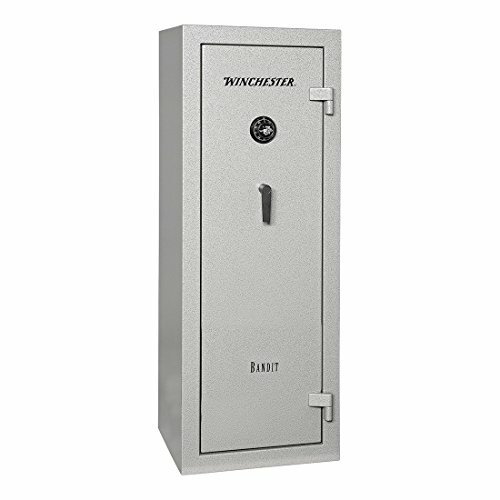 Winchester’s 14 gun “Bandit” safe is one of the most popular medium sized gun safes on the market today– and it’s not hard to understand why. Its slim body makes it easy to store, plus the historic Winchester brand name guarantees quality. 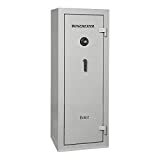 If you already own Winchester rifles, this safe is a “no brainer” purchase. In terms of security features, the Bandit’s tamper proof recessed door and its heavy duty steel body ensure that your guns will stay out of the hands of thieves. Fits in tight spaces. Measuring 60″ tall, 22″ wide and 18″ deep, this safe is big enough to hold lots of guns but small enough to fit in a crowded storage area. Made in America. If you buy this safe, you’ll be helping to create more American jobs. Winchester style and quality. Winchester has a long, storied history of producing high quality goods– and this safe is no exception. Patented fire resistance technology. Winchester has developed Palusol® door seals, which automatically protect your guns in the event of a fire. Thick steel body. Heavy duty 14 gauge steel stands between your valuables and any intruders that want to steal them. Recessed door. This safe’s pry-proof recessed door makes it very hard to crack. Exceeds California gun safety requirements. If you’re a California gun owner, you’re legally required to store your weapons in a safe like this one. Though the steel shelves inside this safe are sturdier than most, they’re not adjustable and cannot be reconfigured. Winchester’s 24 gun “Ranger” is a premium safe with top shelf features not found in other similar products. Its medium sized body makes it a good compromise between huge gun safes designed to hold an entire arsenal of weapons and smaller safes that hold just a small collection of arms. The Ranger has more fire resistance than other Winchester safes, plus it has an electronic tamper proof lock and plenty of room inside to store more than just weapons. Just the right size. 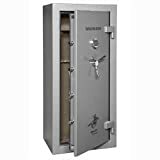 Measuring 60″ tall, 28″ wide and 23″ deep, this safe is bigger than Winchester’s entry level products but still small enough to store in your home. Winchester good looks. The classic Winchester style manifests itself in all its products– and the Ranger’s retro good looks carry on that tradition. Palusol® door seals. 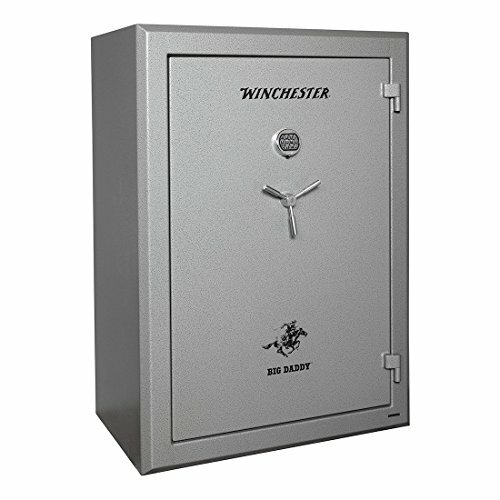 Winchester’s patented fire defense technology is one of the reasons why this safe can survive a full hour of 1,400 degree heat. Made in the USA. If you buy this safe, you’ll be helping to stimulate the United States economy. Extra heavy duty steel. 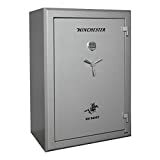 This safe’s 14 gauge steel shell is thicker than most other safes on the market today. Pry proof door. This safe’s recessed door is a simple but very effective guard against crowbars. Auxiliary relocker. If a criminal somehow manages to remove this safe’s lock, its bolts will slam shut automatically. Unfortunately you can’t move this safe’s steel shelves around and reconfigure them if you don’t like how they’re set up because they are welded in place. Winchester’s appropriately named “Big Daddy” safe can hold up to 48 guns. If you have a massive gun collection and you need a way to store and defend your weapons, this could be the safe for you. Because the Big Daddy safe is as heavy as an elephant, it’s not going anywhere once you have it installed. And with it’s 1.5 inch steel bolts, auxiliary locking system, and reinforced steel walls it’s nearly impossible to break into. Massive storage space. This safe is 60″ tall, 42″ wide and 25″ deep– that’s more than enough room to store not only guns but all your other valuables, too. Winchester quality. Winchester is a classic, high quality American manufacturer that has been churning out quality products since the 19th century. 75 minutes of fire resistance. With its ability to withstand over an hour of 1,400 degree heat, the Big Daddy is one of the most fire resistant safes on the market today. Manufactured and assembled in the USA. If you believe in always buying American and you need a huge safe, the Big Daddy is the obvious choice. Thicker walls than most. This safe’s 14 gauge steel walls are better, thicker and stronger than most. Tamper proof door. The door’s recessed design makes it impossible to open with prying tools. Emergency relocking system. If the safe detects an intrusion, its bolts slam shut automatically. Weighing in at 803 pounds, this safe is probably too heavy for most average homes.